NBC news reporter Gadi Schwartz making eyes at San Francisco for the mountains of plastic bottle waste that come out of the city every day. Happy Earth Day, every one! Humans are assaulting Mother Earth in many ways, and single-use plastics is a killer. 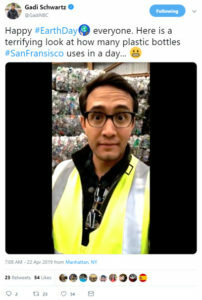 It can take up to one thousand years to decompose in landfills. Or it ends up in the environment or the ocean, killing animals and fish. So please: say no to plastic. If you absolutely must use a plastic bag or bottle, be sure to do your best to reuse and then recycle it. I ran out to Cougar Mountain Zoo today. 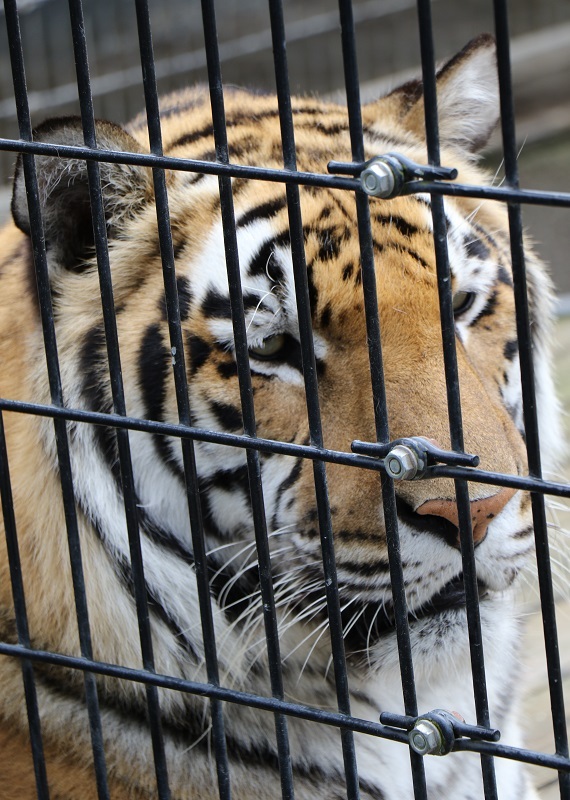 It’s a smallish (11 acres) zoological park located on the north slope of Cougar Mountain about 15 miles east of Seattle. These are my pictures. 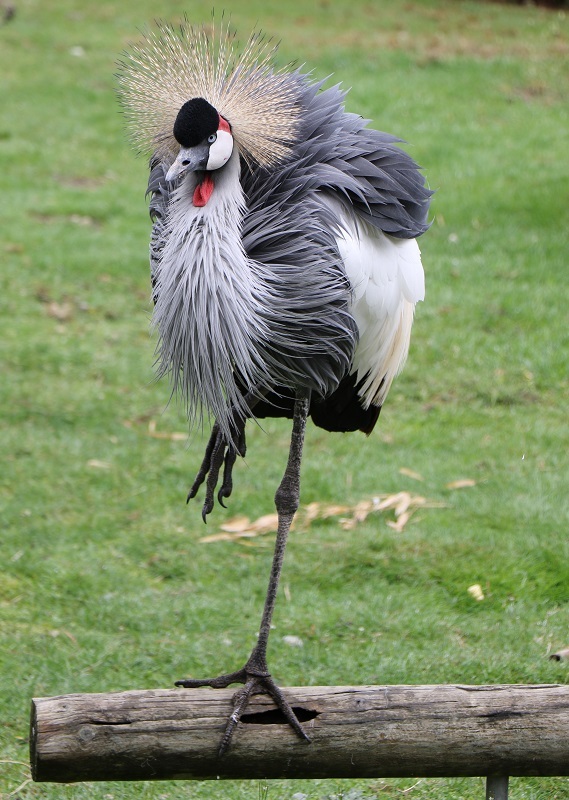 The grey crowned crane (Balearica regulorum) is native to eastern and southern Africa, and is the national bird of Uganda. 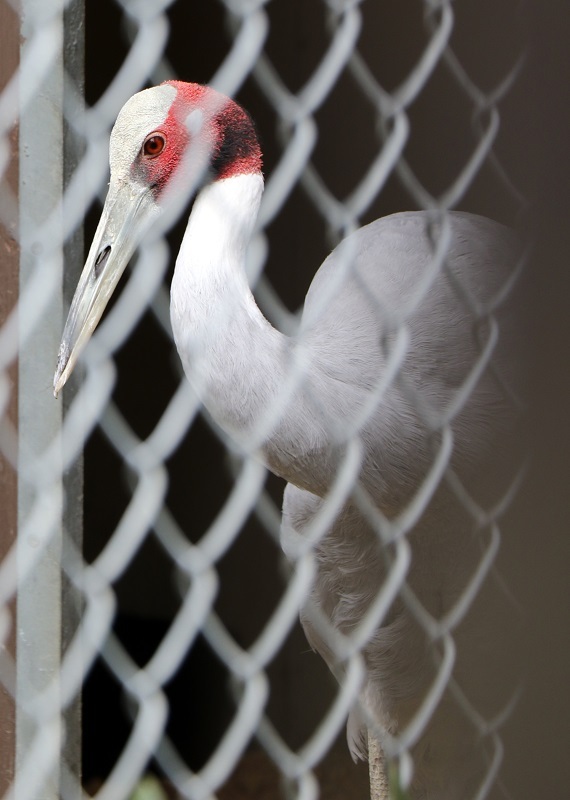 Here’s the best I shot I could get of the sarus crane (Grus antigone), found in parts of the Indian subcontinent, southeast Asia and Australia. They are the tallest of the flying birds, standing at a height of up to 5 ft 11 in (1.8 m). 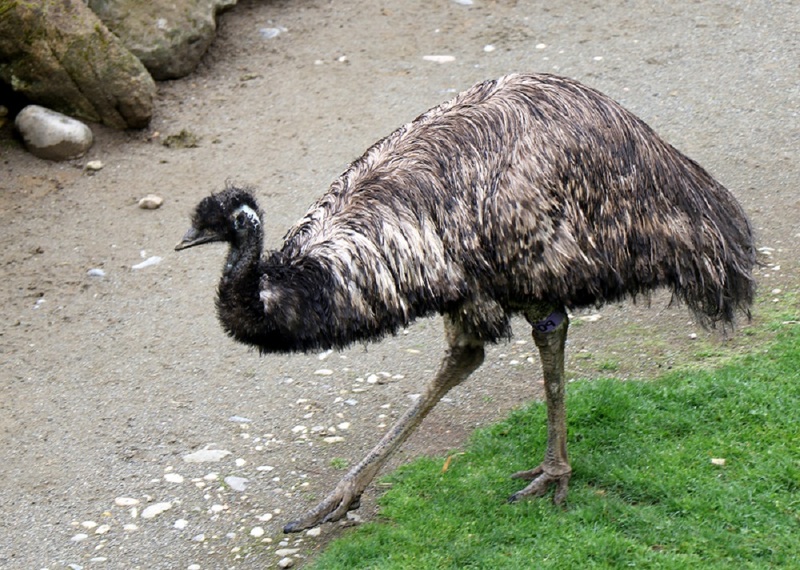 The emu (Dromaius novaehollandiae) from Australia is the second-largest living bird after the ostrich. They weigh about 80 lbs (36 kg). Another Australian creature at the zoo, a marsupial called the wallaby. 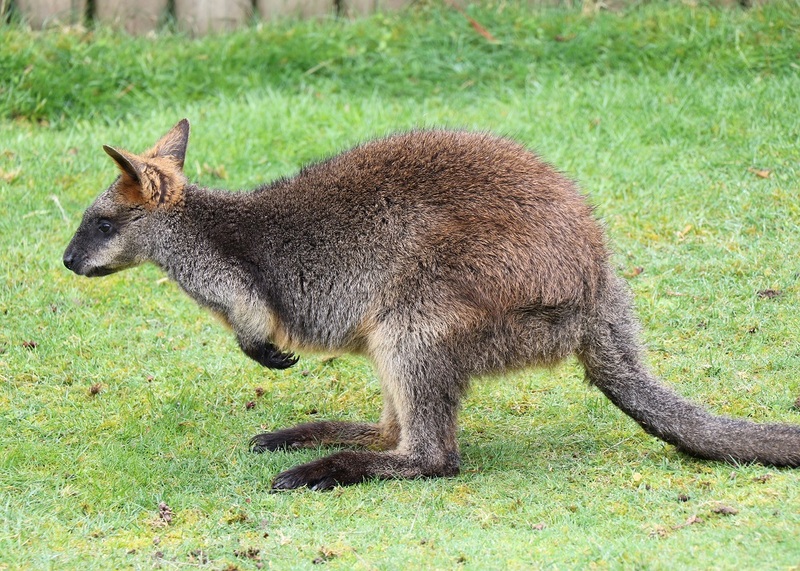 There are dozens of species and this one is a swamp wallaby, sometimes called a black wallaby (Wallabia bicolor). This is a gray wolf or timber wolf (Canis lupis). They come in different color variations in their coats. 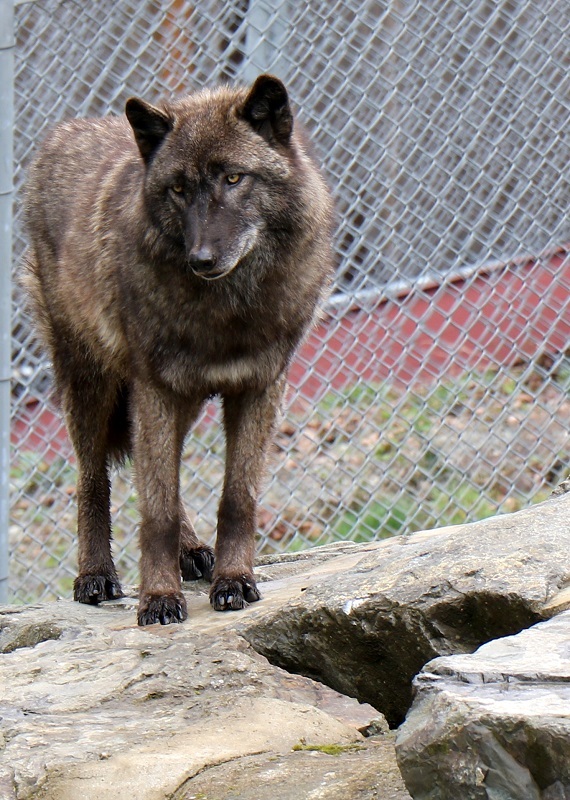 Washington State’s wolf population has been doing OK in recent years, with the numbers slowly increasing. Most are found in the northeastern quarter of the state. At the end of 2017, there were at least 122 wolves counted in 22 packs, with 14 breeding pairs. (Man – that still does not sound like a very large number to me!). It’s cold and there is no jungle here! 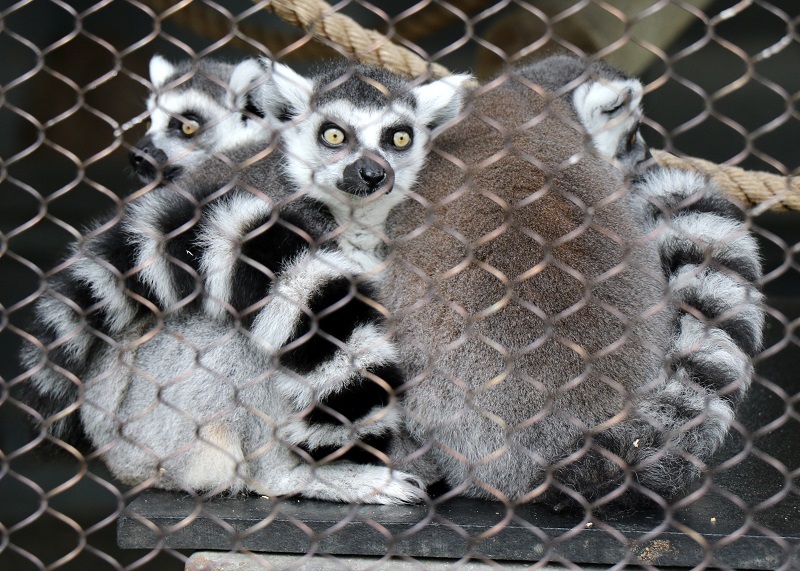 .. so these ring-tailed lemurs (Lemur catta) huddle together. They are an endangered species, native the to island of Madagascar of the east coast of Africa. On to the exotic birds. 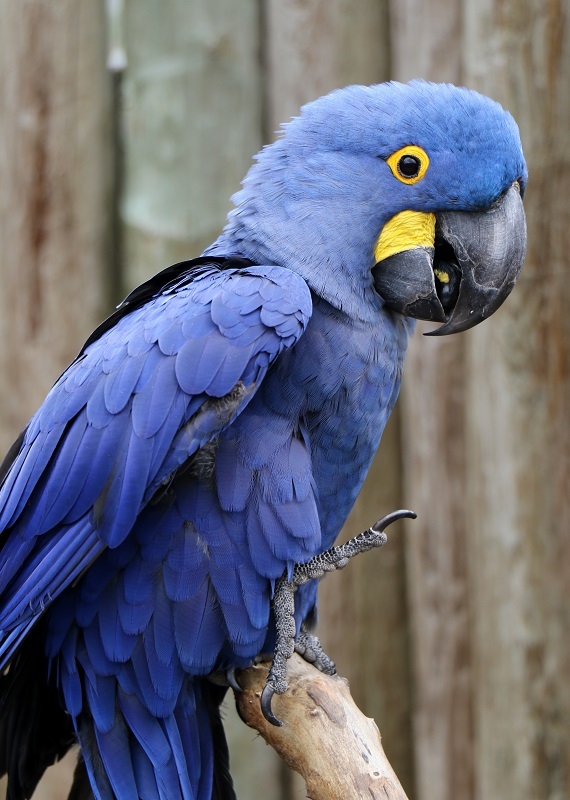 Here is the hyacinthine macaw or blue macaw (Anodorhynchus hyacinthinus). 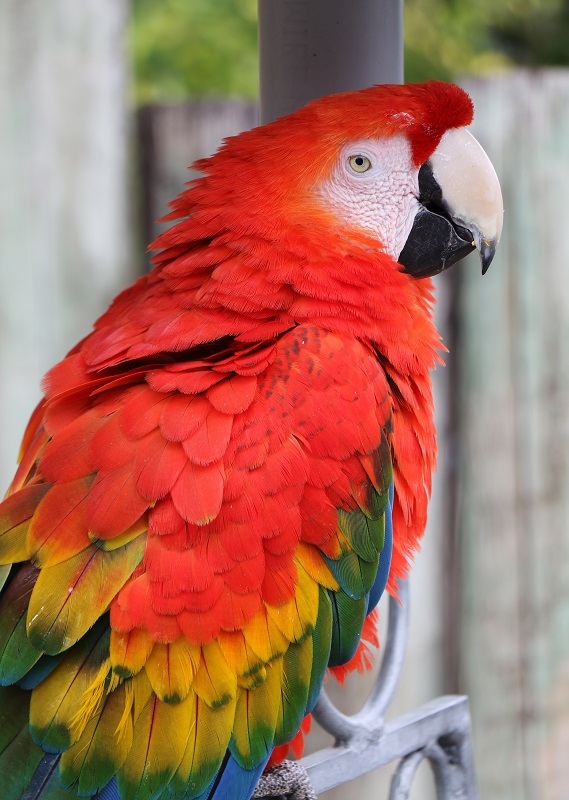 It is a parrot native to central and eastern South America. 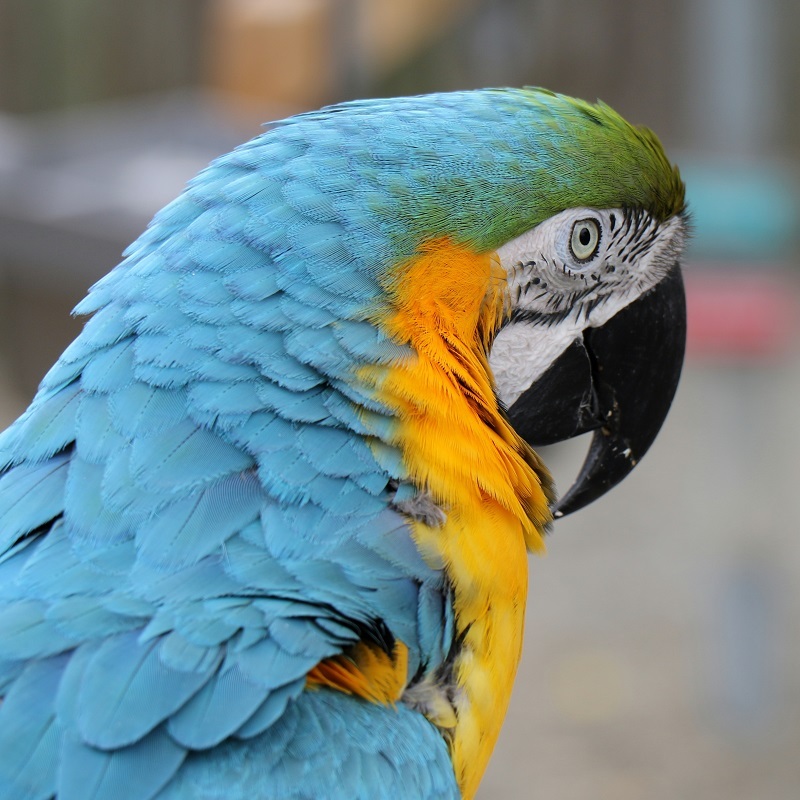 It is the largest of the macaws, and can live up to 50 years of age. ‘Hmm. I will just sit here and look spectacular in my red feather get-up’ .. is what this scarlet macaw (Ara macao) named Kiwi, seems to be thinking. 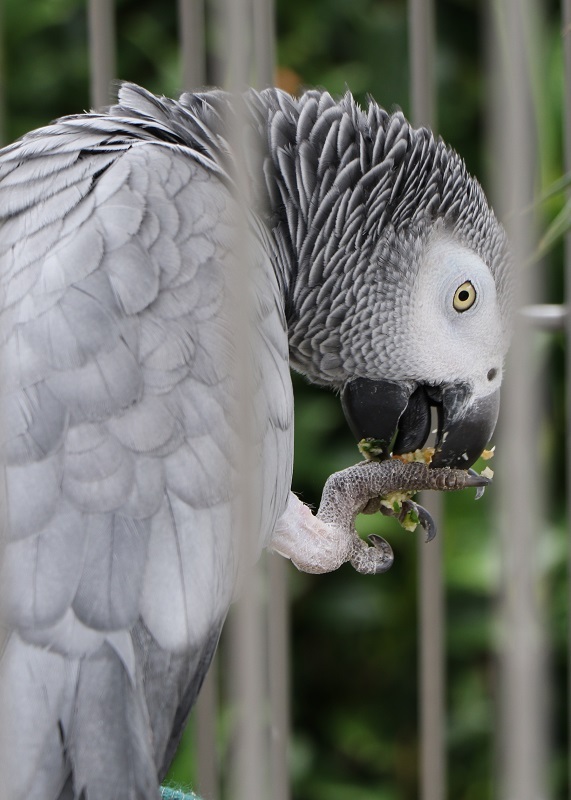 And here is Paco the African grey parrot (Psittacus erithacus), eating some food that got stuck on his foot. These parrots are native to equatorial Africa. 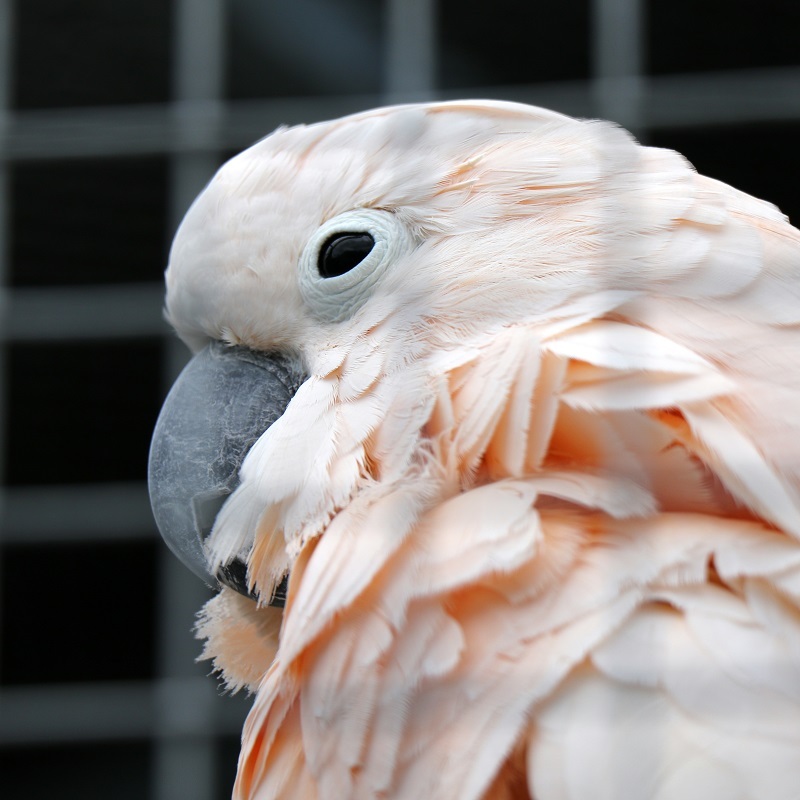 These guys are great companion parrots, prized for their ability to mimic human speech, and may also live up to 50 years. From Indonesia, the Moluccan cockatoo (Cacatua moluccensis). 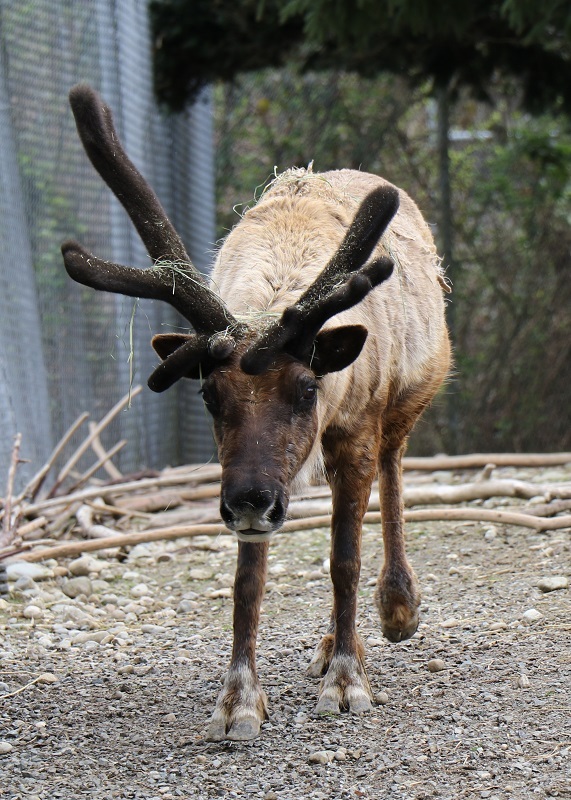 And here is a reindeer (Rangifer tarandus), one of a little herd at the zoo. 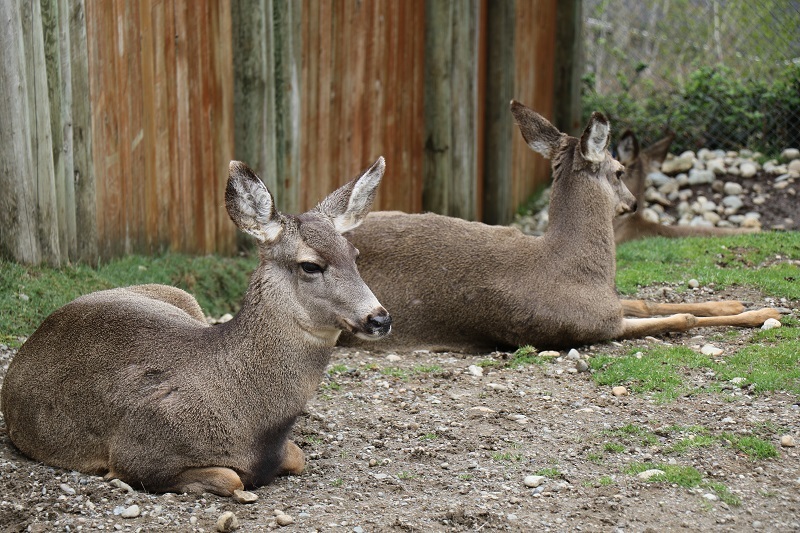 These deer are native to arctic, sub-arctic, tundra, boreal, and mountainous regions of northern Europe, Siberia, and North America. This zoo has the largest herd of Siberian Reindeer in the United States. Tigers are still found in parts of India, Bangladesh, Nepal, Bhutan and Burma – but are critically endangered in the wild, and almost certain to become extinct in the next decade. 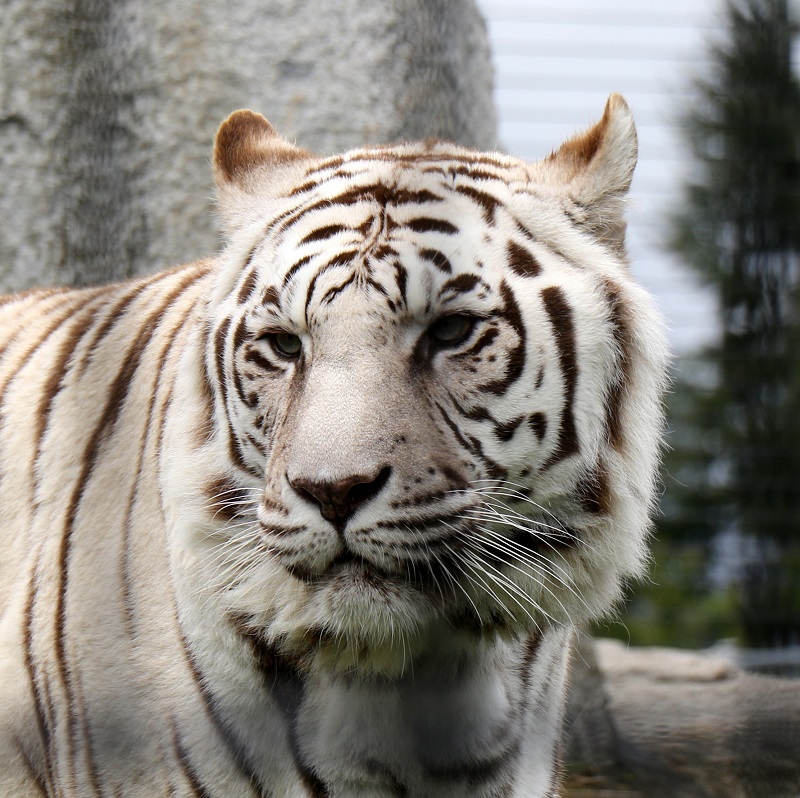 This is a Bengal tiger (Panthera tigris tigris), with the white color variation. 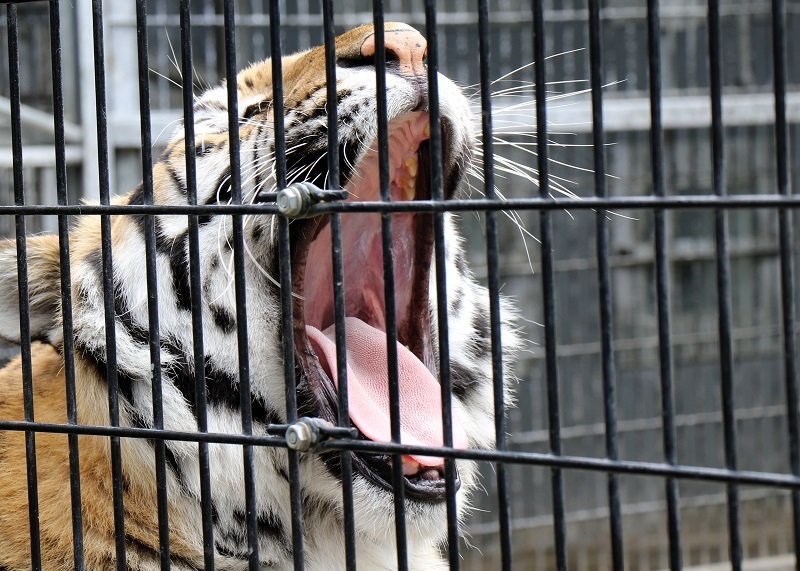 This is not an albino, or a separate species from the orange and black Bengal tigers. Here’s the classic orange-black-and-white coated Bengal tiger (Panthera tigris tigris). I’m keeping my distance and using my zoom lens through one of the two fences. Even so, I was not of much interest to the big feline. It was getting ready to .. Finally, here is the famous mountain lion or cougar (Puma concolor). I love its heavy tail. 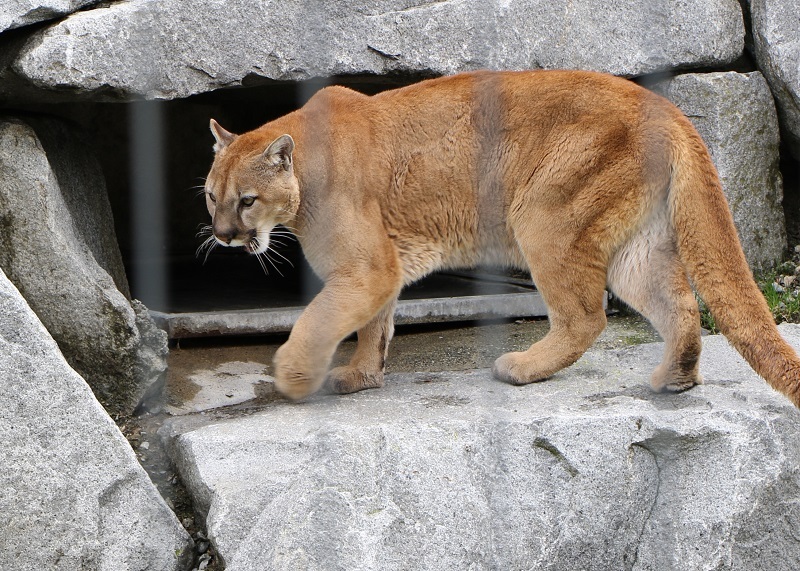 Sadly, the Eastern cougar (Puma concolor couguar) is now officially extinct. On the western side of North America, cougars are doing OK for now, in the wild. We’re finally getting some rain again here in the city (and 58 °F/ 14 °C). Here’s a spectacular camellia flower that I found a few blocks from my house. 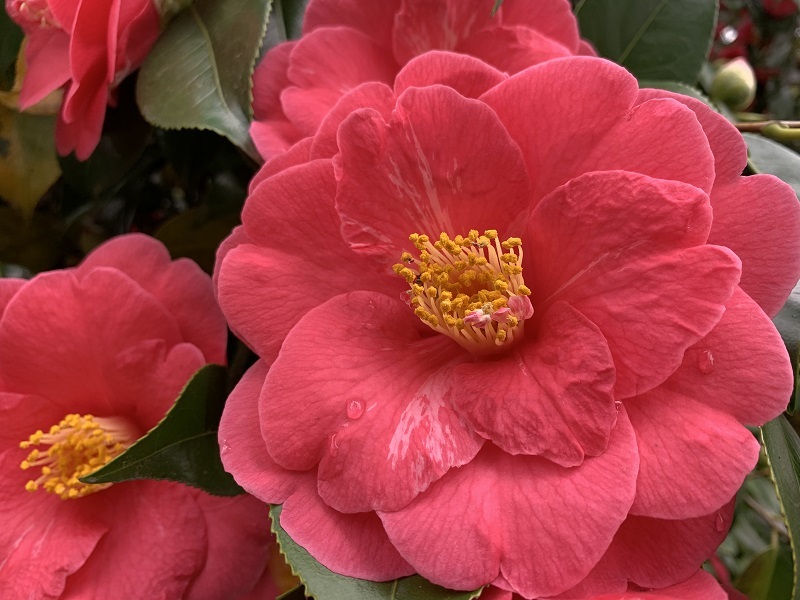 I have a camellia shrub in my front yard as well, but its flowers are not quite as big these! 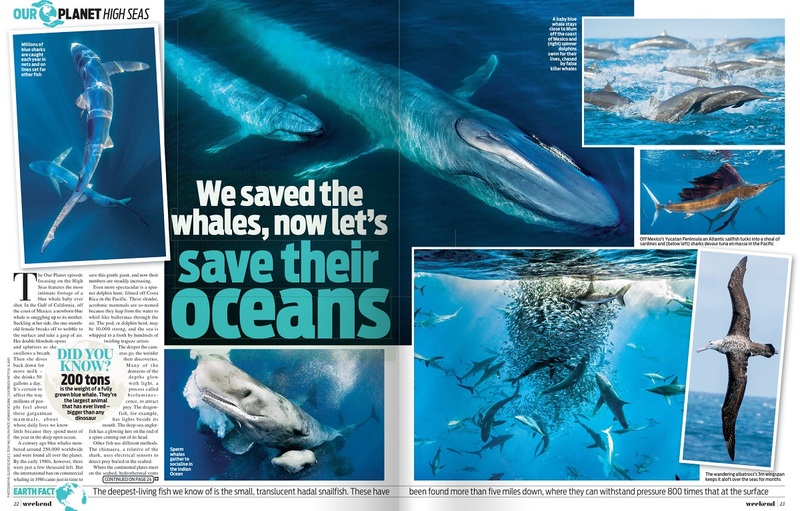 Tuesday/ Our Planet: can we save it? The spectacular – and spectacularly upsetting, it looks like to me – Our Planet series of episodes from renowned filmmaker Sir David Attenborough (he’s 92) is set to debut on Friday on Netflix in 190 countries. It may draw a total audience of one billion viewers. The material has been four years in the making, with filming done in 50 countries and with the collaboration of the World Wildlife Fund. No bones are made about the impact that human activity has had on the planet. Humans are accelerating what is called the Sixth Extinction, of plant and animal species across the globe. 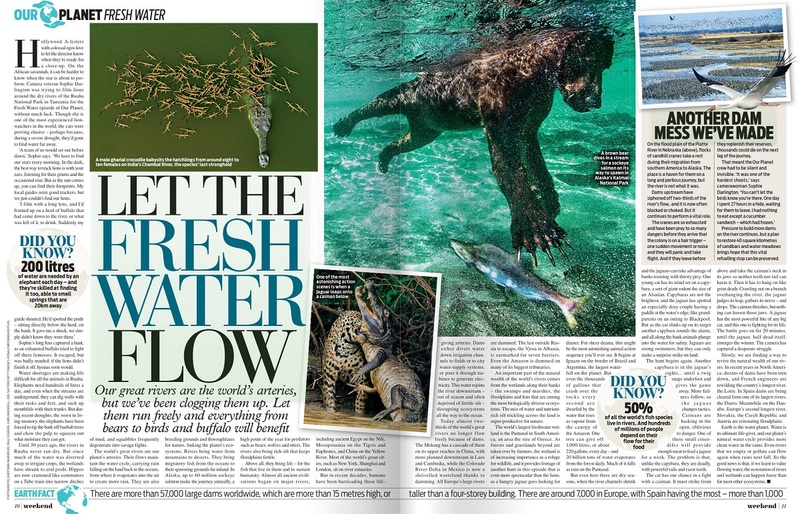 Below is a preview and a few photos from the series, that the Irish Times had published over the weekend. 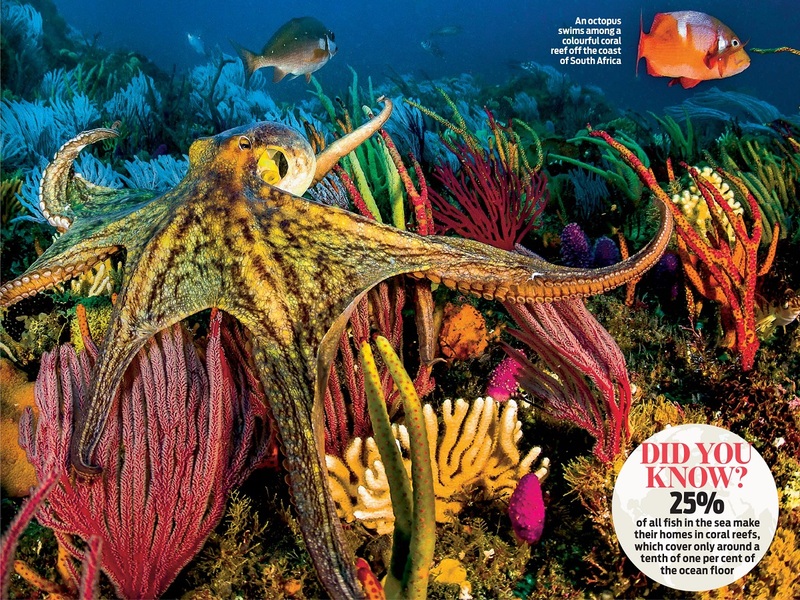 The octopus in the last picture is off the coast of South Africa. Here’s 16th Avenue at 7.08 pm today. (Sunset is at 7.32 pm). Green leaf and flower buds are starting to sprout everywhere. These big gnarly trees that have seen many winters, are a little slower to wake up from their slumber. 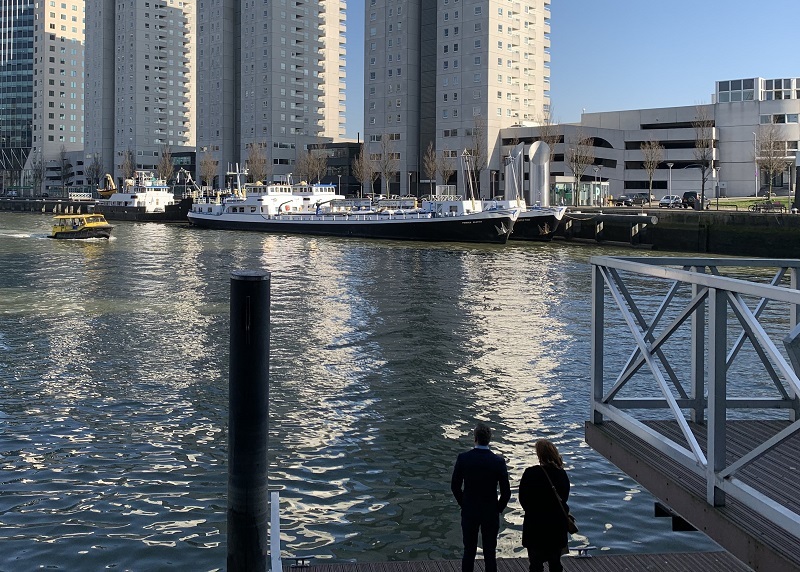 It was a gorgeous day here in Rotterdam, with the day temperature reaching 17°C/ 62°F. Here is a selection of sights from today. 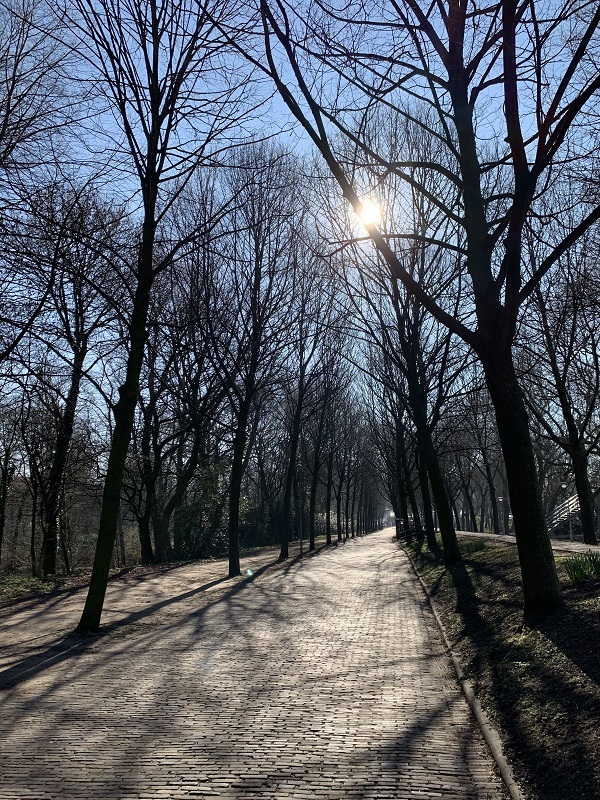 This bike path & foot path is next to Het Park (‘The Park’), on the way to the Euromast. 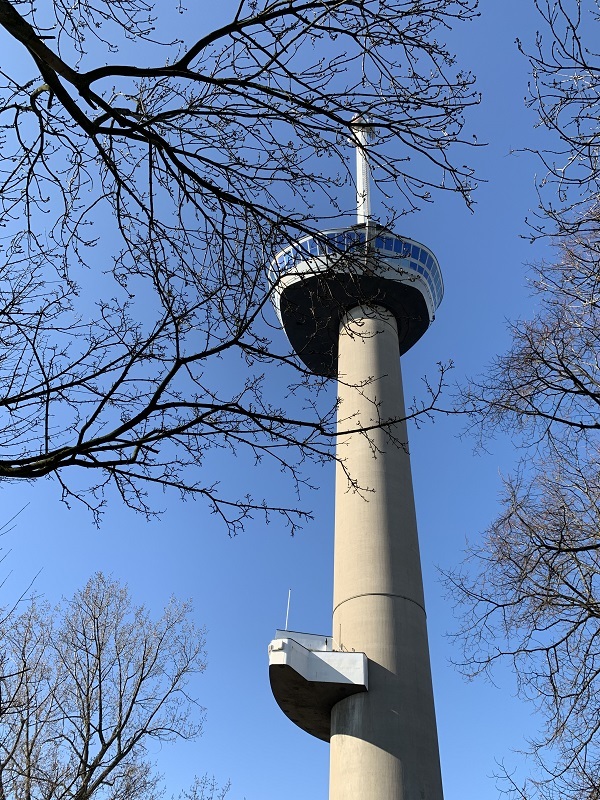 Euromast is an observation tower (185 m/ 606 ft), built for the 1960 Floriade (an international exhibition). The tower is a concrete structure. It was built on a concrete block weighing some 2,000 metric tons, so that the center of gravity is below ground. 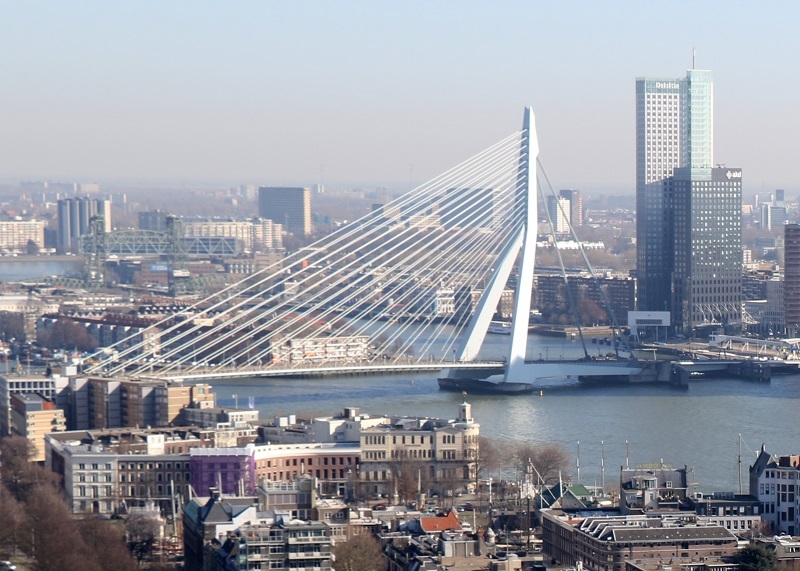 Here’s a view of the Erasmus Bridge (139 m/456 ft high, 802 m/ 0.5 mi long), from the panorama platform at 85 m (278 ft), drawn a little closer with my camera’s zoom lens. 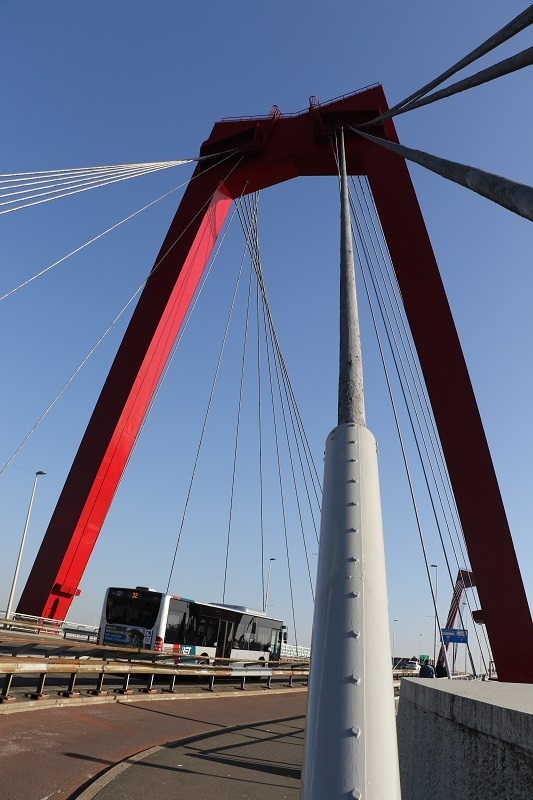 The bridge is a combined cable-stayed and bascule bridge over the Niewe Maas river. The bridge was named after Desiderius Erasmus, a prominent Christian Renaissance humanist. It opened in 1996. Another view from the panorama platform. Look for the flat barge with the blue containers. It first entered the lock at the top (middle right of the picture), then water was pumped in to raise the barge by some 6 ft, and right now it is making its way under the second drawn bridge, into the canal. 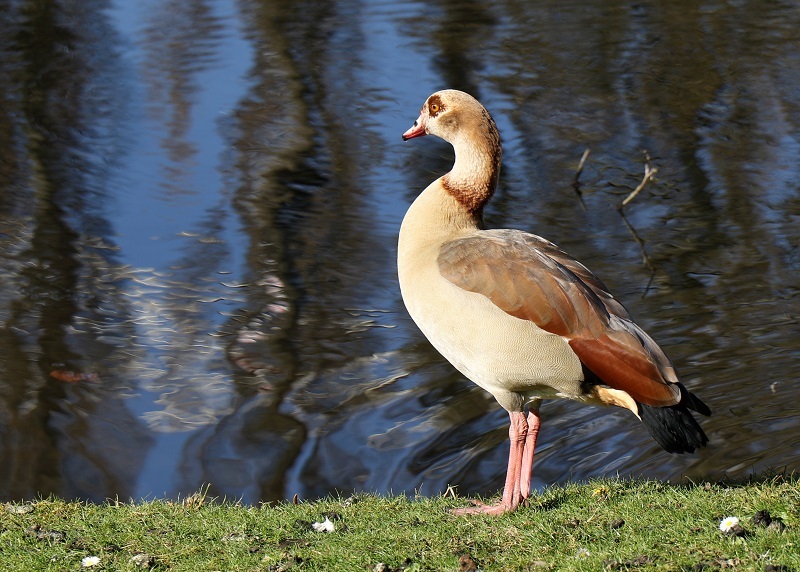 This Egyptian goose (‘Kolgans’) is native to Southern Africa, but I guess one finds them in many other places in the world, as well. This is at a little lake in Het Park (‘The Park). 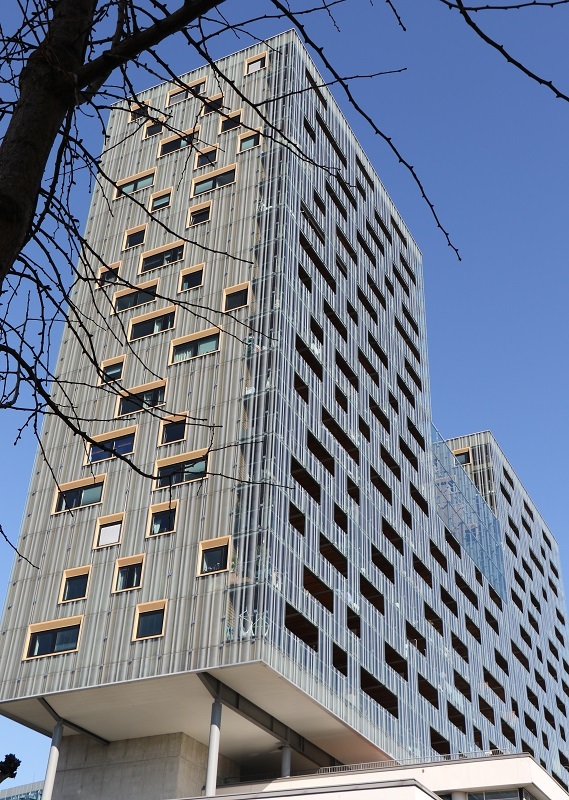 This eye-catching apartment building is close to Eendrachtsplein. I still have to look up its name and construction date. 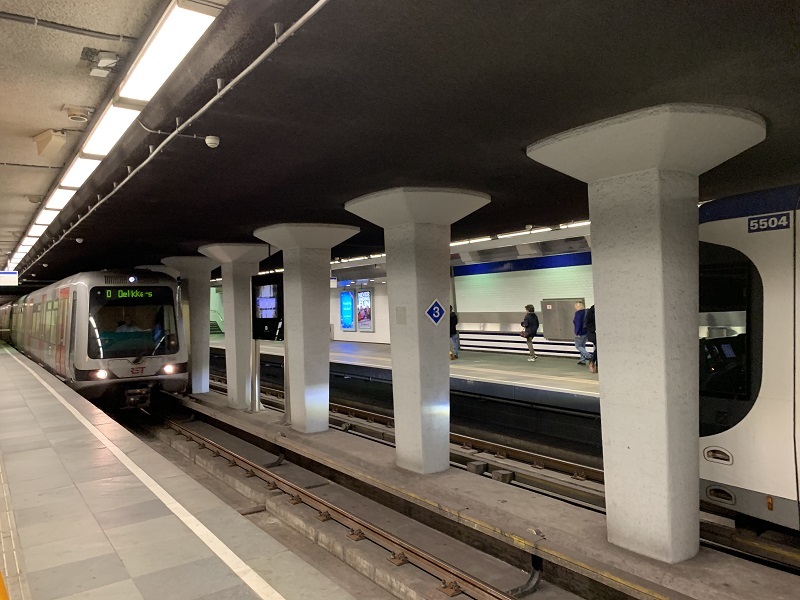 This is the Metro train at Beurs station, a suburban train that runs to the outer suburbs of Rotterdam. It took me to Leuvehaven by the waters of the Niewe Maas river. Here’s the Rotterdam Water Taxi, coming to pick up a couple at a stop on a canal close to Leuvenhaven station. 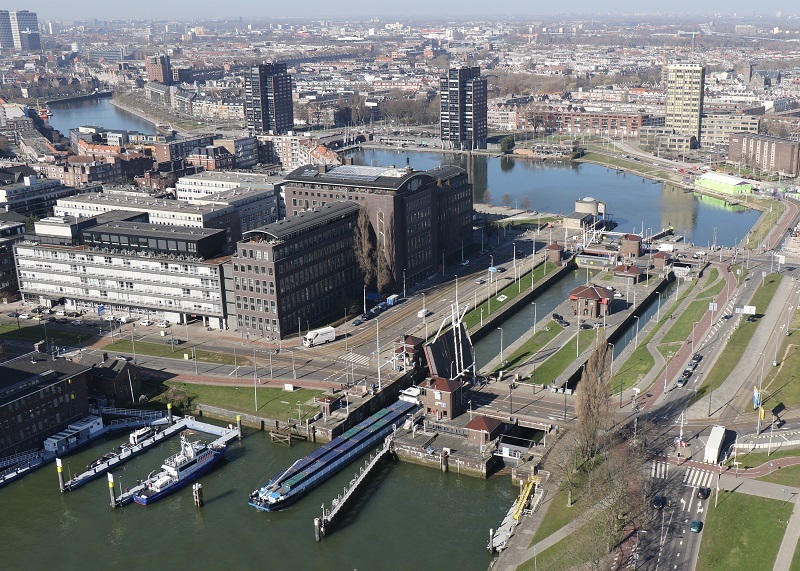 The Niewe Maas river is on the other side of the buildings. I started at the Erasmus Bridge (seen earlier from the Euromast), and then walked to the red Willemsbrug (Willem’s Bridge, named after named after King Willem III of the Netherlands, and of course, after ME too). Opened: 1981 | Height: 65 m 213 ft | Length: 318 m / 0.2 mi. The gorgeous Witte Huis (‘White House’) is near Willemsbrug. 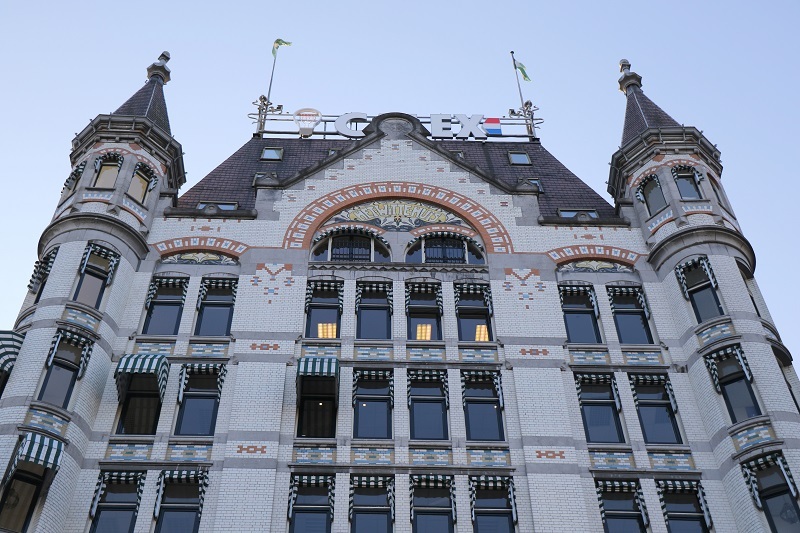 It was built in 1898 in the art nouveau style, and was for long the tallest office building in Europe (the first ‘hoogbouw’ = tall build, at the time, with 10 floors). 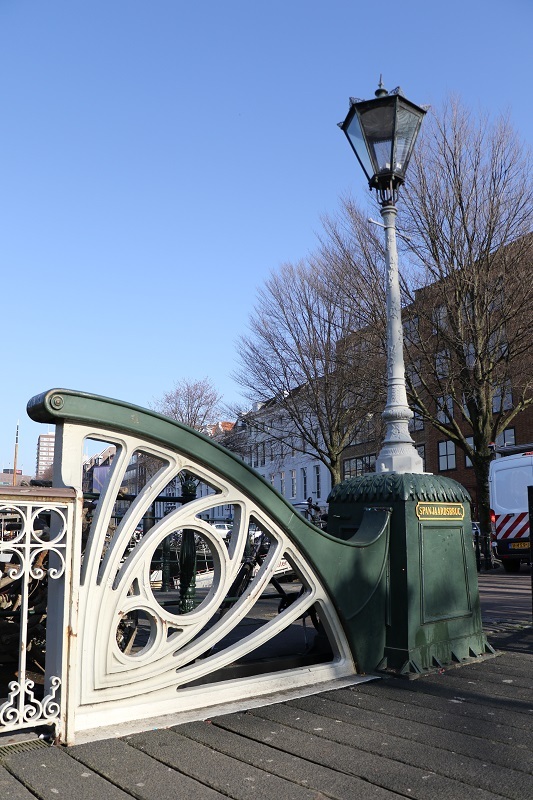 This is the little Spanjaardsbrug (‘Spanish Bridge’) in the Oude Haven (‘Old Harbor’). The bridge was built in 1886, and I just love the art elements of the Victorian age, that went into it. 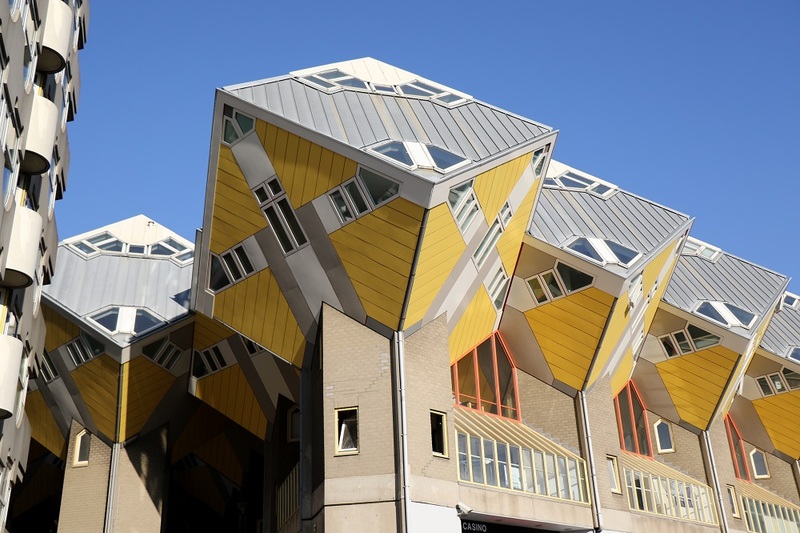 The crazy Cube houses at the Oude Haven is a set of innovative houses designed by architect Piet Blom. Yes, there are actually people living in them, and the design’s main purpose is said to optimize the space inside (hmm, OK). I was surprised to find out they had been built in 1977, already. 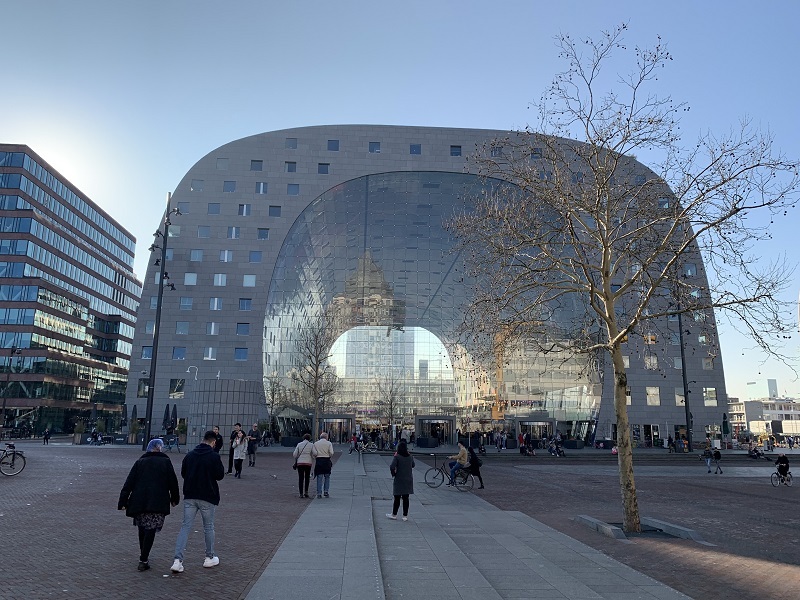 The Markthal (Market Hall) nearby, is a new residential and office building (2014) with a market hall underneath. 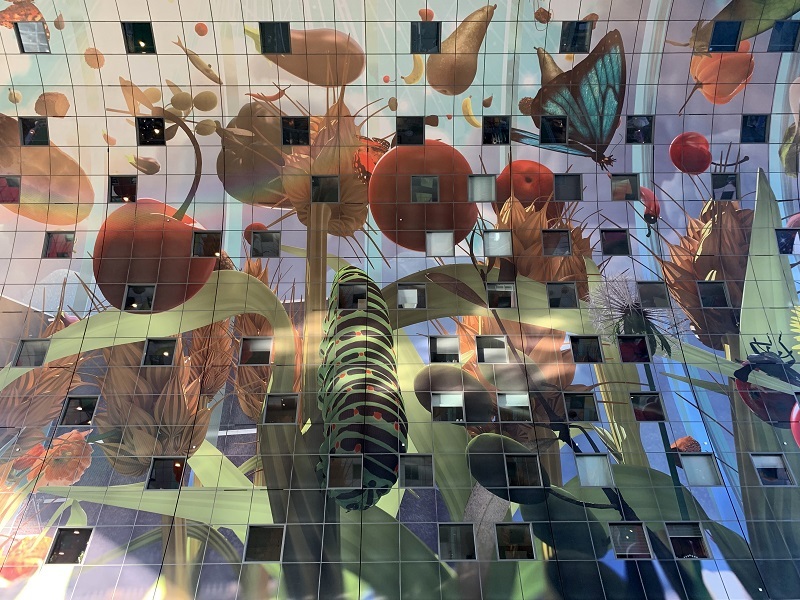 Beautiful and enormous mural artwork inside the Markthal. This depiction of a caterpillar might just be the largest in the world. 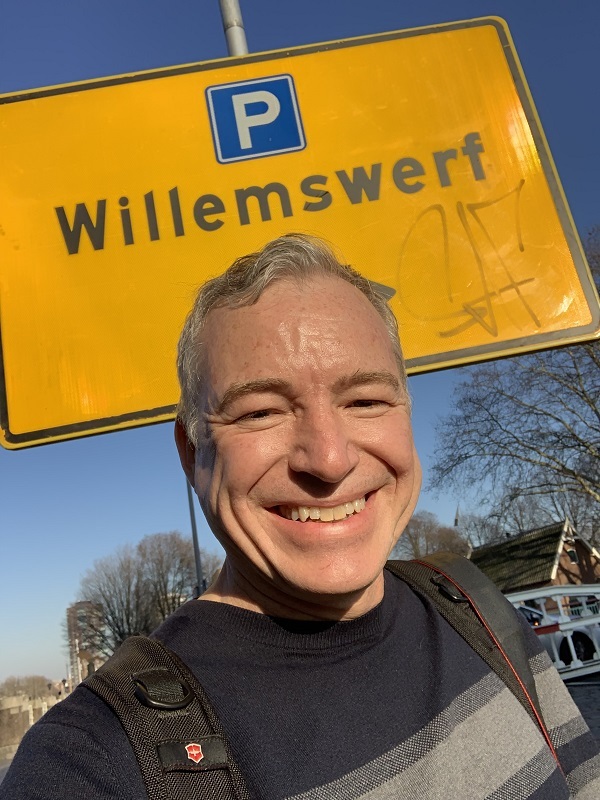 .. and finally, Willem says: Come to Willemswerf (Willem’s Yard) to park your car in Rotterdam! The sugarbush is from the protea family. The ‘flowers’ are actually flower heads with a collection of true flowers in the center, surrounded by bracts (modified leaves). In days gone by, the nectar used to be collected and cooked into a syrup. 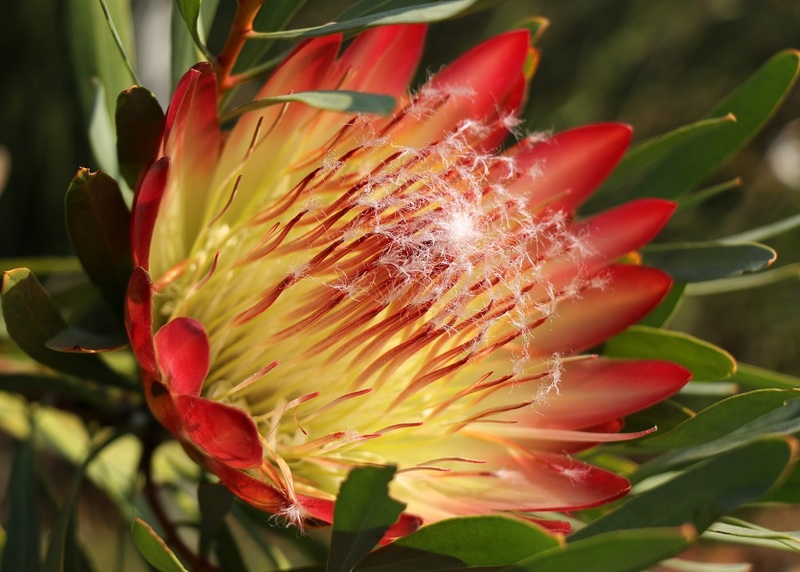 I found this beautiful sugarbush (Protea repens) flower in the Stellenbosch Botanical Garden today. 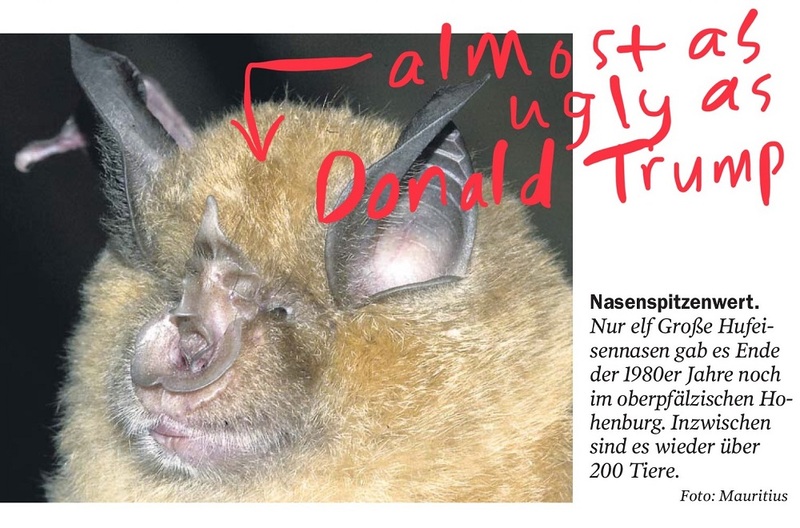 There is a report in my German newspaper of the greater horseshoe-nose bat that had made a comeback in the Hohenburg area in Germany – albeit only through sustained efforts of conservationists. They made sure the bats had suitable roosting places, and that enough cows were around to produce the dung favored by dung beetles that the bats like to catch in flight ! Photo from Der Tagesspiegel newspaper (I could not resist adding the red lettering). Translation: The Value of the Nose Tip. Only 11 Greater Horseshoe Nose Bats were found in the 80s in the Hohenburg area. Since that time, there are now again more than 200 animals’. The bat is about 12 cm (5″) with a wingspan of 35 cm (14″). The horseshoe nose is for generating beeps for echolocation (the echoes then picked up by their special ears, of course). We are back in Perth. 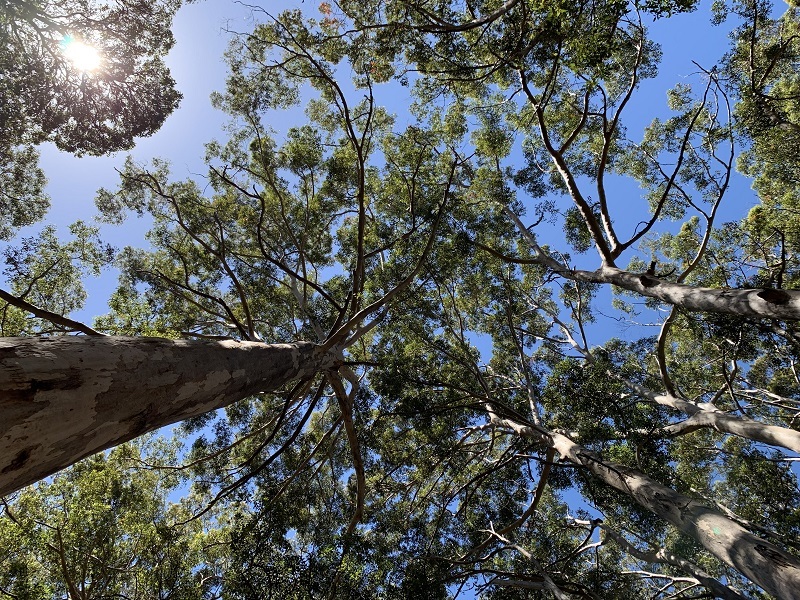 My late-afternoon walk through the little green space here (the Ron Carroll reserve), was rewarded with a sighting of a black-faced cuckooshrike. (They are actually a fairly common sight in Australian cities). Our time is running short here at the resort by Geographe Bay. There is a nice walk & bike track that runs along the beach. For me, it’s hard to just walk, though, and not stop and investigate the sounds and glimpses of the exotic birds in the bushes. 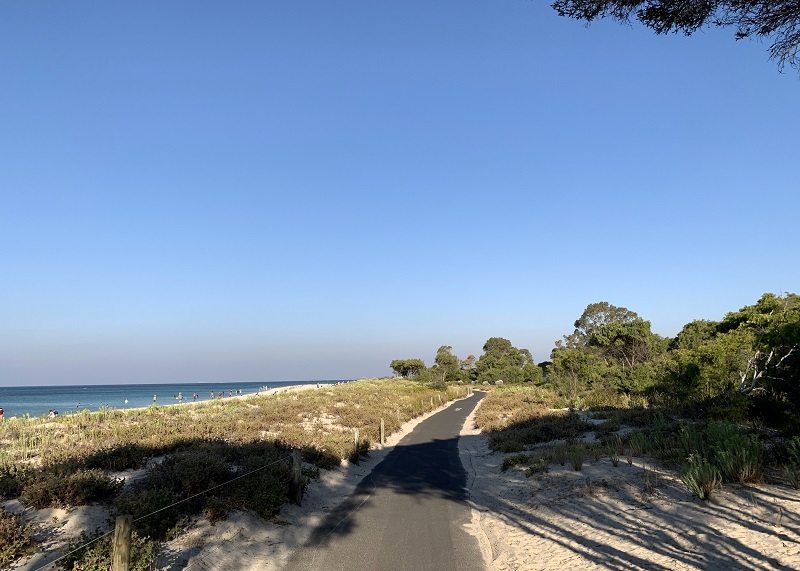 Here’s the late afternoon scene outside our resort: a nice walk & bike track that goes on for miles, a sandy dune, and the beach nearby. 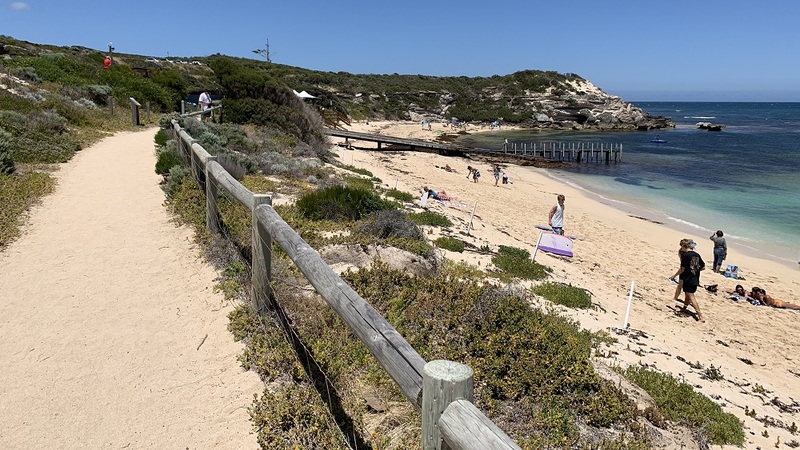 That’s Geographe Bay, tranquil with great swimming and snorkeling, and not as much to offer to surfers and paddle boarders. 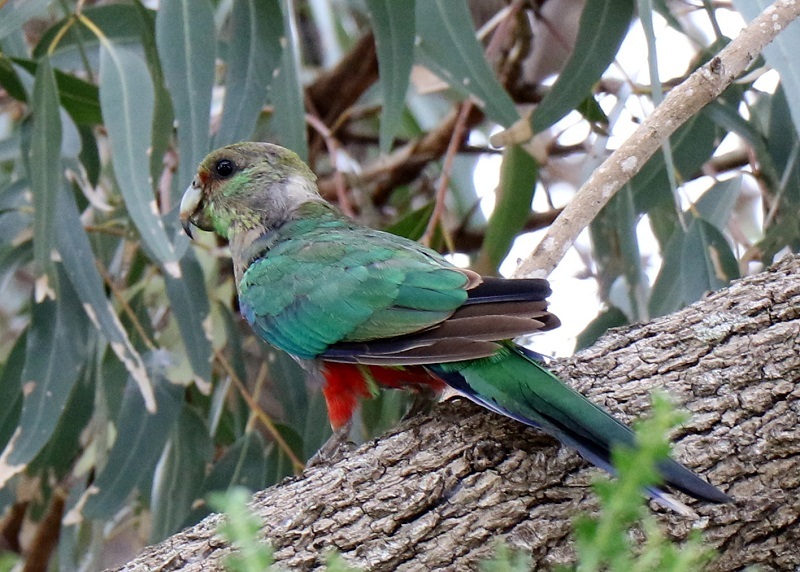 This is a young red-capped parrot (Purpureicephalus spurius), native to this southwest corner of Western Australia. This one still has a greenish plumage overall, but before long it will sport a bright crimson crown (same color as its leg feathers), and yellow cheeks. 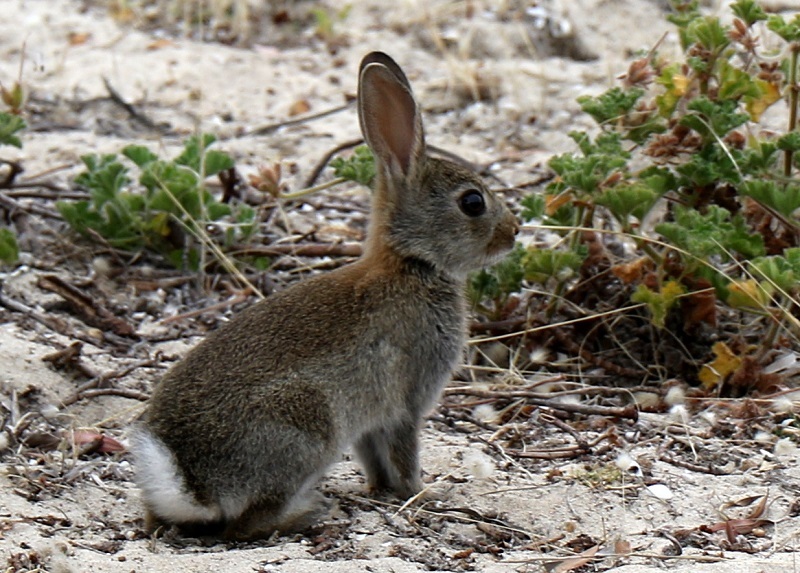 Yes, this fella is an oh-so-cute little wabbit – BUT WAIT: it is an European rabbit (Oryctolagus cuniculus). They were first brought to Australia by the First Fleet in 1788, and have become a serious invasive species and pest, since then. They do serious damage to crops, and destroy food supplies critical to native species. Wednesday/ who is the monster? The big pink monster living inside the vacation villa, almost stepped on the little brown monster basking outside on the brick paving. 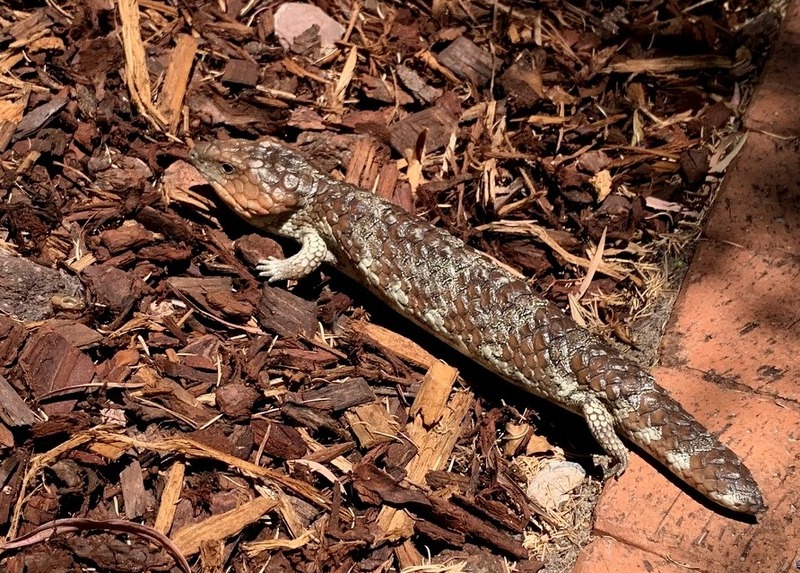 A bobtail skink/ western shingleback (Tiliqua rugosa) scuttling out of my way, grumpily. It has a heavily armored body and a stumpy tail, and a bright blue tongue. The creatures are omnivores, eating herbs and seedlings, snails and insects. Fat in the tail helps it survive lean times. On Monday we went to the beach for a bit, and then stopped at a viewpoint in Boranup forest. Here’s Gnarabup beach (the ‘g’ is silent). The jetty in the distance is for jet skis and sea kayaks, and not for fishing boats. It was a little windy, but the water temperature was great for swimming. This is Boranup Forest between Margaret River and Augusta. 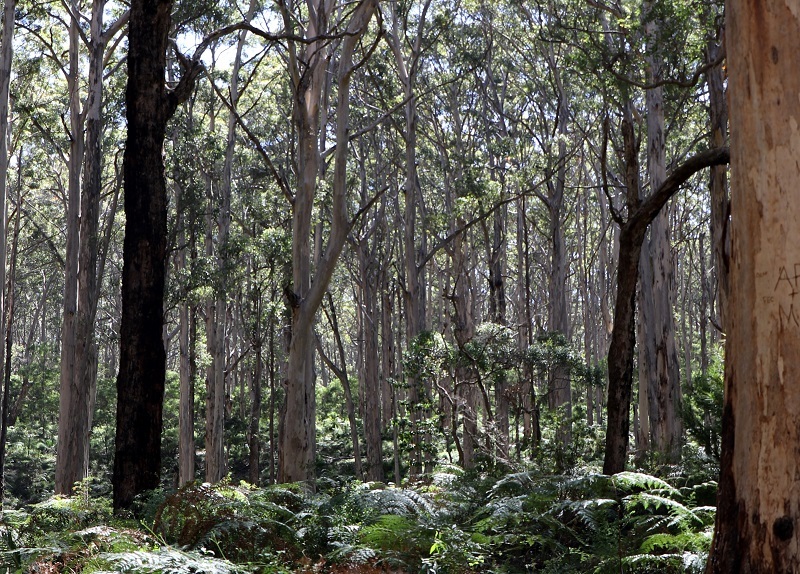 It is a karri forest (type of eucalyptus tree) with towering trees, but also with ferns on the forest floor. It’s a long way up! Some 50 m/ 150 ft to the top of the tree canopy. 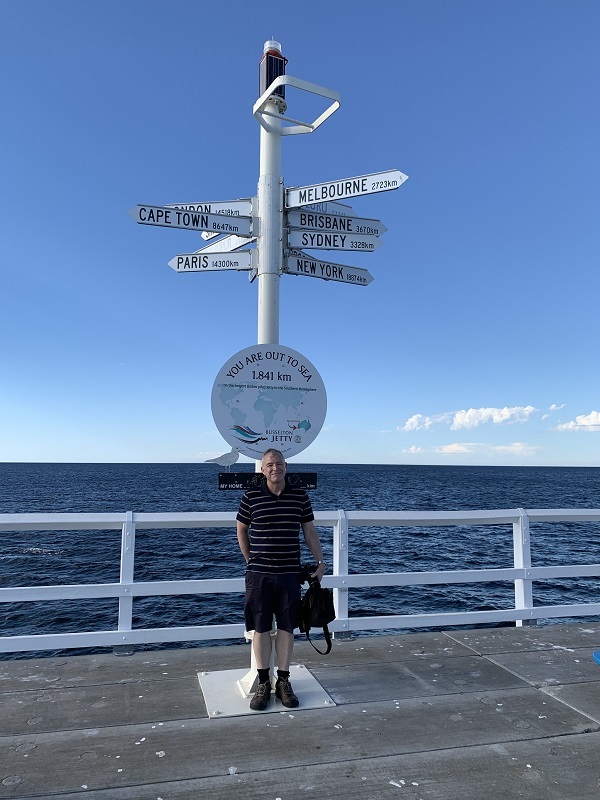 We walked out to the very end of the long Busselton jetty today. There is a little train and an undersea viewing area as well, but maybe we will do that next time. 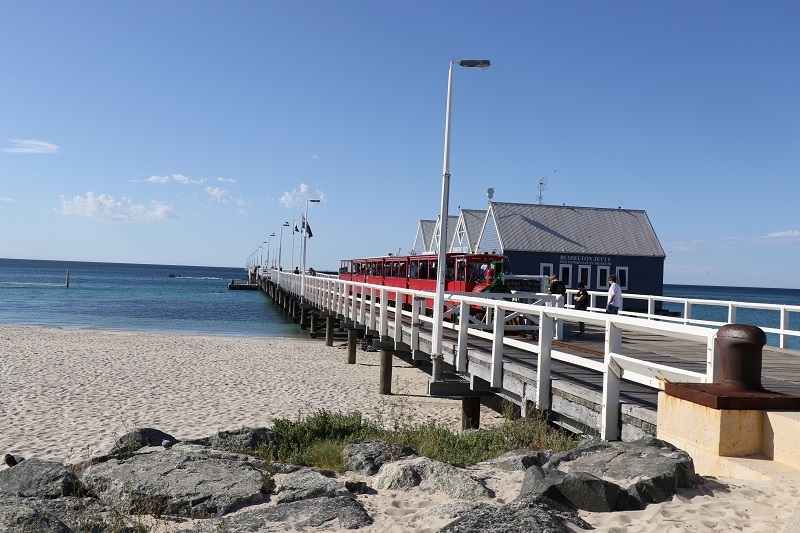 The current incarnation of the Busselton jetty. The original jetty’s construction began in 1865. 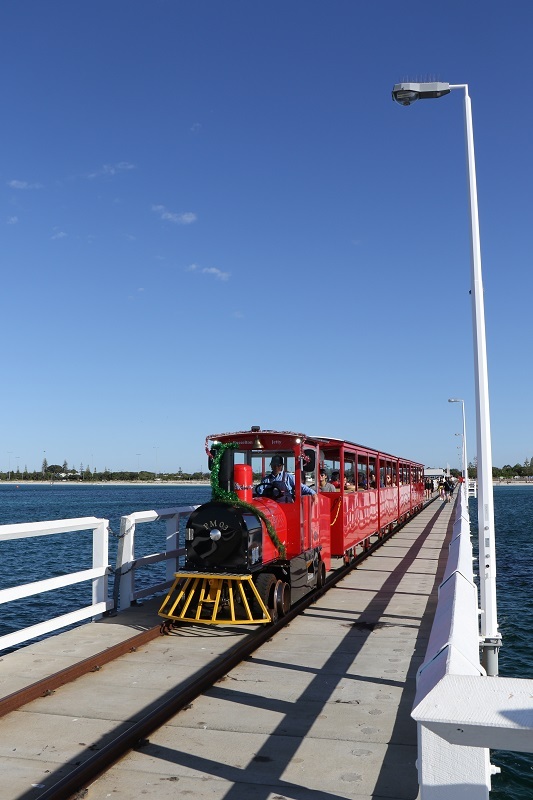 Yes, that’s a little red train, that runs on tracks to the end of the jetty. It’s 1.84 km/ 1.2 mi long to the very end. 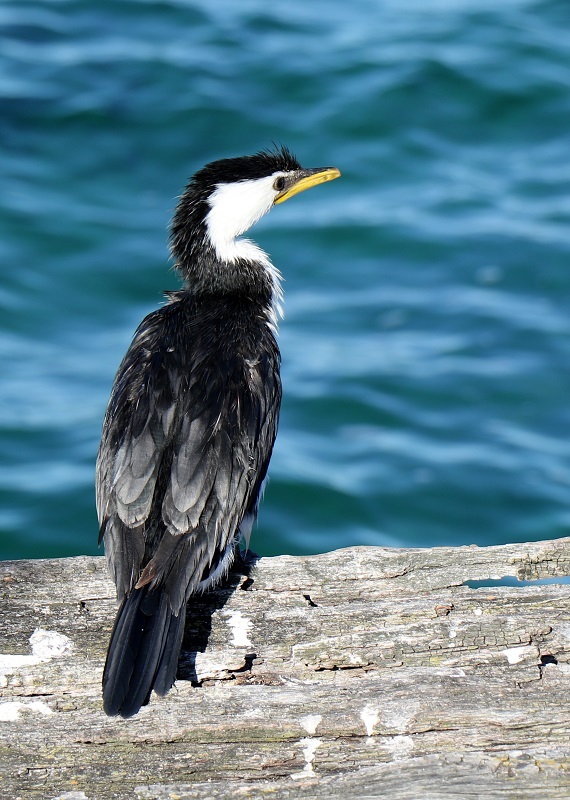 A little pied cormorant or kawaupaka (Microcarbo melanoleucos) on wood beams next to the pier. The bird is a diver, finding prey on the sea floor in shallow waters. 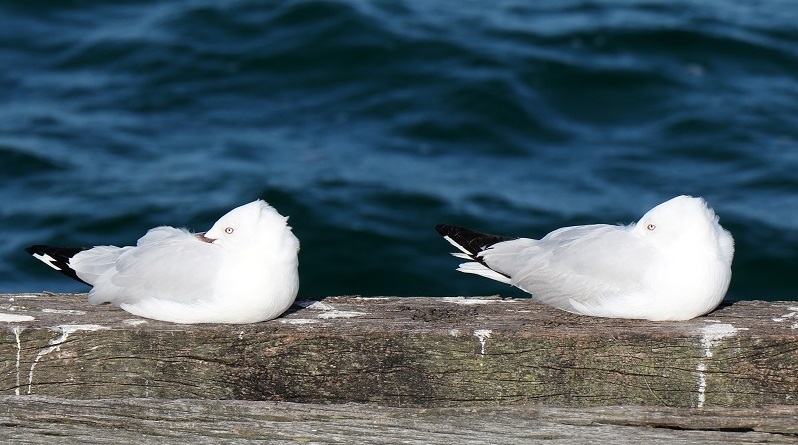 Looks like these silver gulls (Chroicocephalus novaehollandiae) are getting ready to turn in and get a little sleep, even though it was only 6 pm. This the most common gull seen in Australia. Here comes the electric train called the ‘Stocker Preston Express’. It’s really not an express train. It runs only barely faster than one can walk!. The distance sign at the very end of the pier. Cape Town is 8,647 km (5,372 mi) away. Seattle is 15,021 km (9,334 mi) away! 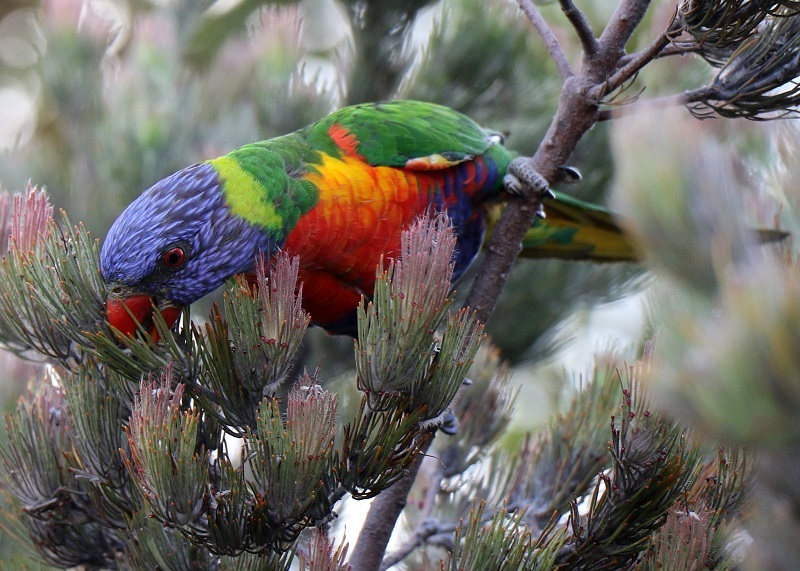 I found this spectacular rainbow lorikeet in a little green space in my brother’s neighborhood (Ron Carroll Park) while walking through there on Saturday morning. Here’s a little black and white bird that is a long-time favorite here in Perth: the willy wagtail. They are very active (and wag their tails, of course), and voracious insect eaters – said to be able to consume their own body weight in insects in a day. 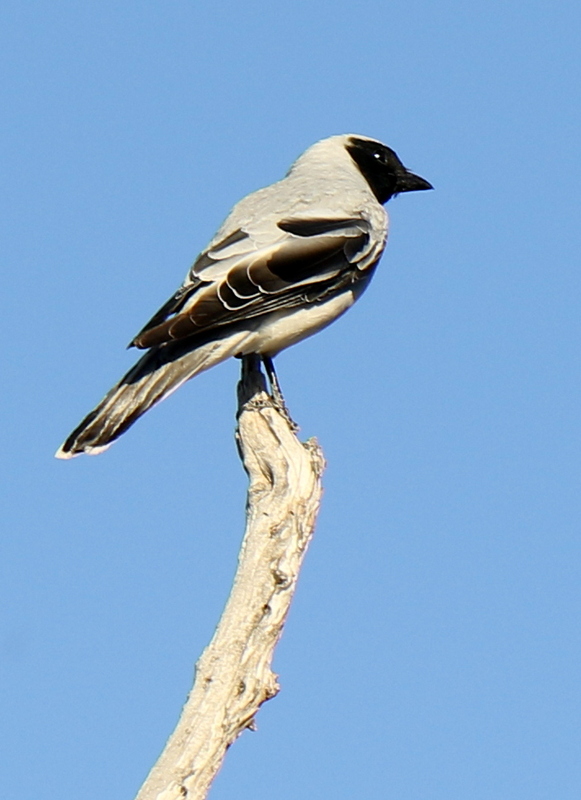 The wagtails were known to the Noongar Aboriginal people as chitty chitty, because of their trademark chattering sound. 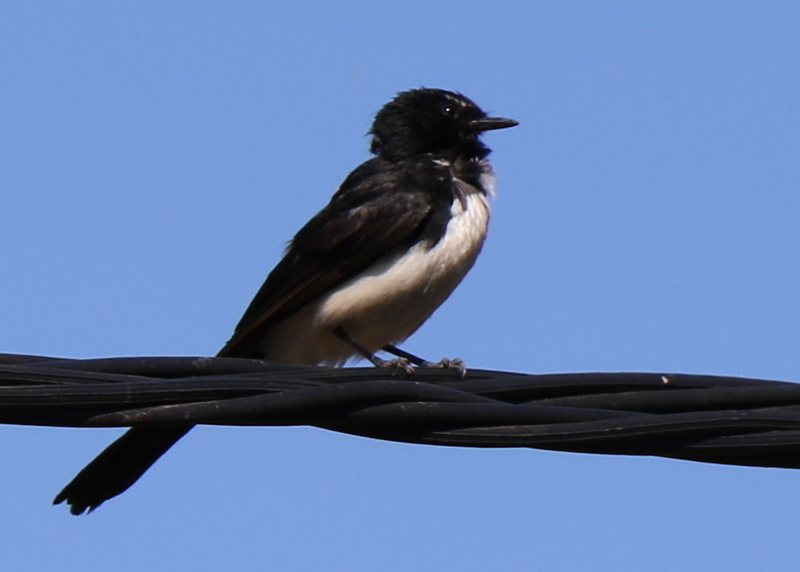 Here’s a willy wagtail (Rhipidura leucophrys) that I found here by my brother’s house today. They are found all over mainland Australia. Man! I was spending way too much time scrolling through my Twitter feed today. Trump’s ‘I’m a tariff man’ tweet inflicted heavy losses on the stock market. And it’s official: Seattle is getting a new NHL (National Hockey League) franchise team. 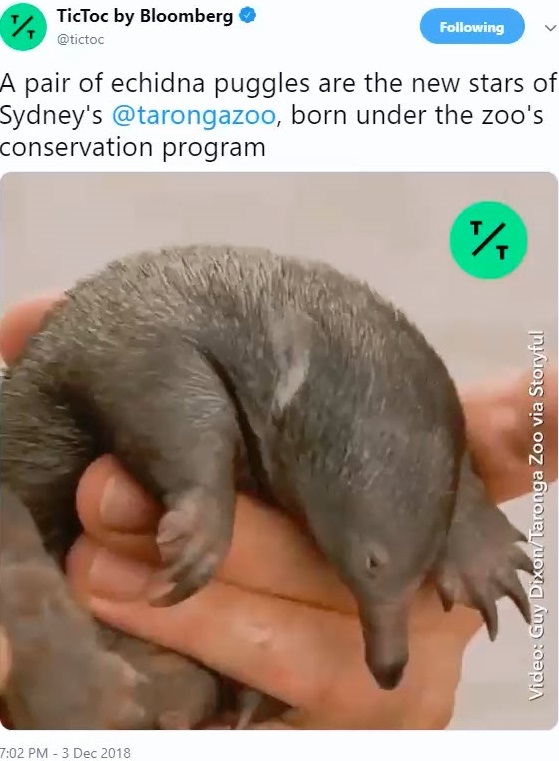 But the tweet of the day for me, was of this cute echidna puggle, born in Sydney’s Taronga Zoo. They are very unusual mammals: the young hatch out of a leathery egg in their mother’s pouch, and stay there for 45 to 55 days. 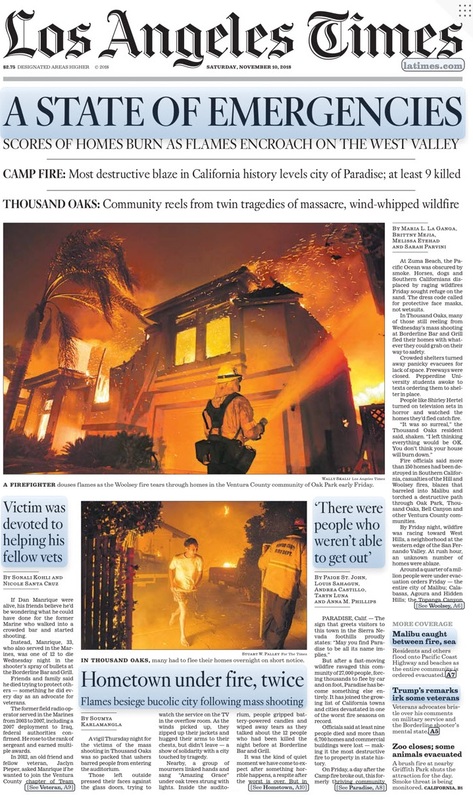 I was sadly mistaken, assuming that the summer wildfires in California had been under control. The Camp Fire is now the most destructive fire in the state’s history. 23 people have died with 100 more still reported missing. The fire has destroyed nearly 6,500 structures. 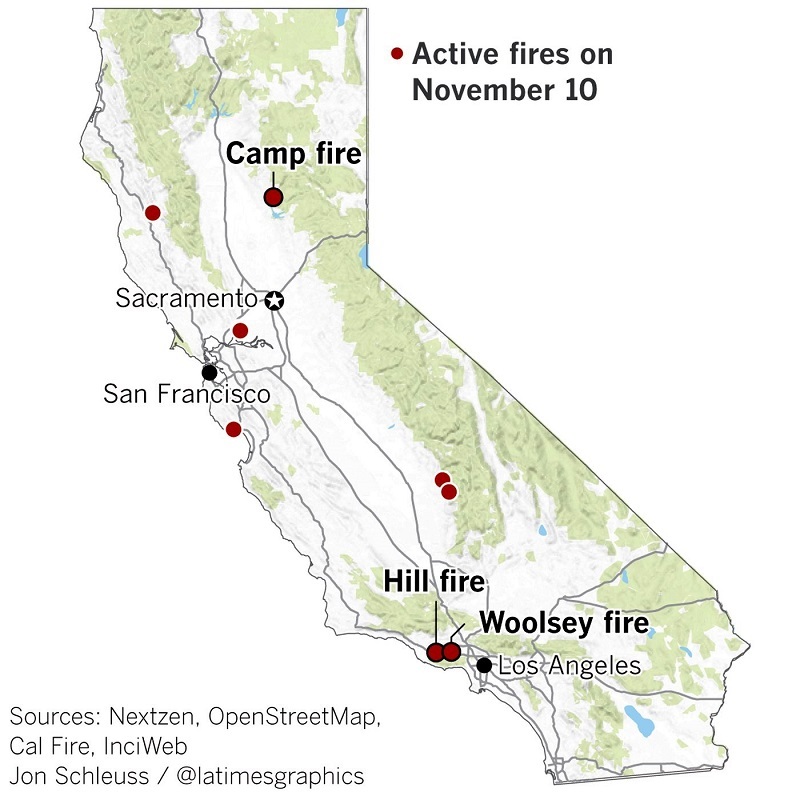 Further south, the Woolsey Fire has scorched 70,000 acres (130 sq mi), and forced 250,000 people to evacuate in the Malibu area. Friday/ hey little bird, what’s your name? 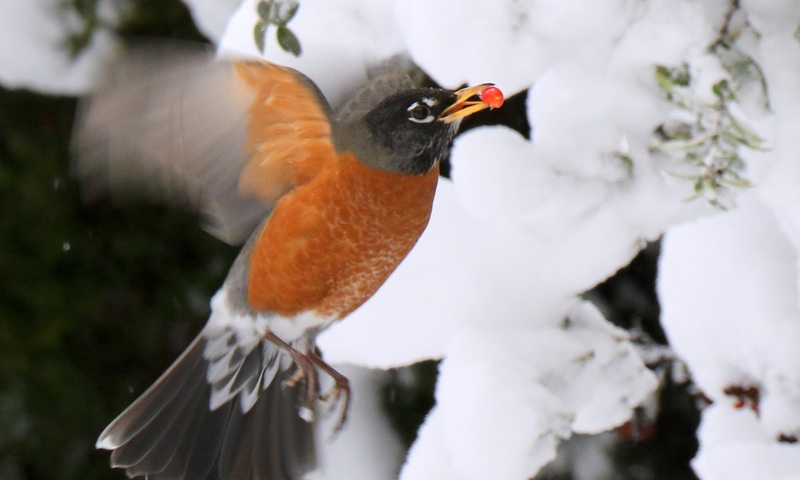 These little birds like to hop around in my backyard sometimes, looking for fallen seeds. This morning, one was finally ready to pose for his close-up. (It’s time to get a 500 mm telephoto lens, if I’m going to be serious about shooting pictures of little birdies like these!). 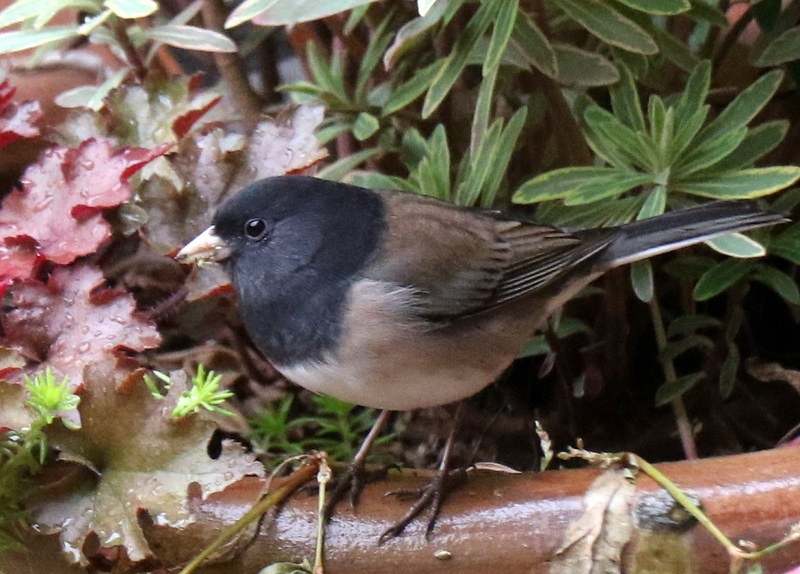 It took a little searching to find it online, but now I know: it’s a dark-eyed junco. Dark-eyed juncos (Junco hyemalis) belong to a genus of American sparrows. This one is a male with the so-called Oregon coloring: black head & chest, brown back, white belly. It was sunny today, but we only got up to 52°F/ 11°C. 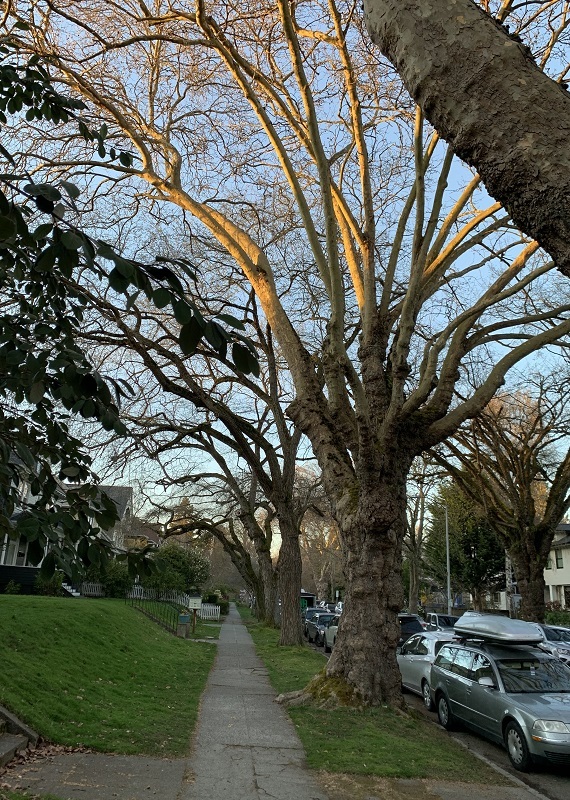 The sunlight we got, was gone by 4.41 pm – the time the sun now sets in the Pacific Northwest. Yikes. (On Saturday night, across the United States, we set our clocks back from Daylight Saving Time to Standard Time*). *California voters approved Prop. 7 on Tuesday, a proposal to permanently stay on Daylight Saving Time. The measure still requires a two-thirds vote from the California legislature and a change in federal law before it can take effect, though. 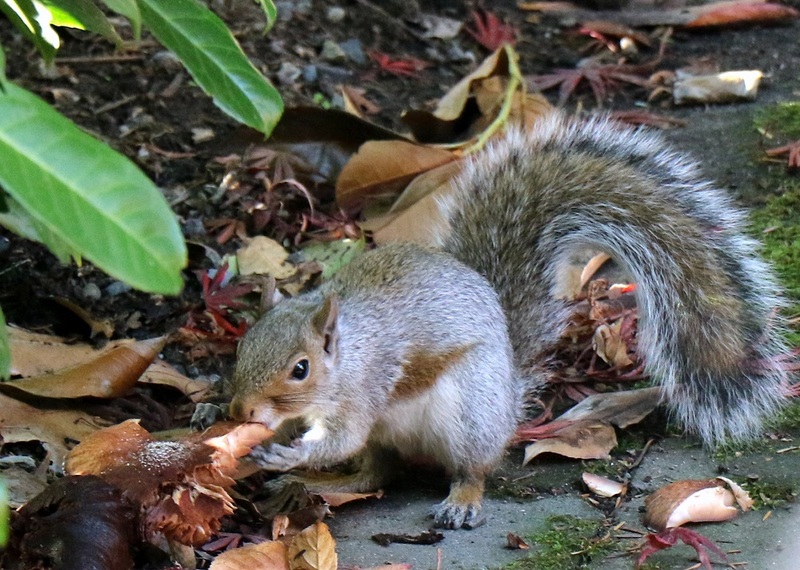 The squirrels in my backyard were out and about in the sun, and hey! munching on the honey mushrooms under the laurel hedge. I have the big fly agaric (red with white spots) mushrooms this year as well, but they just nibble on those and then leave them alone. The fly agaric is not deadly toxic, but it does contain psychoactive substances that produce hallucinations in humans (and squirrels?). 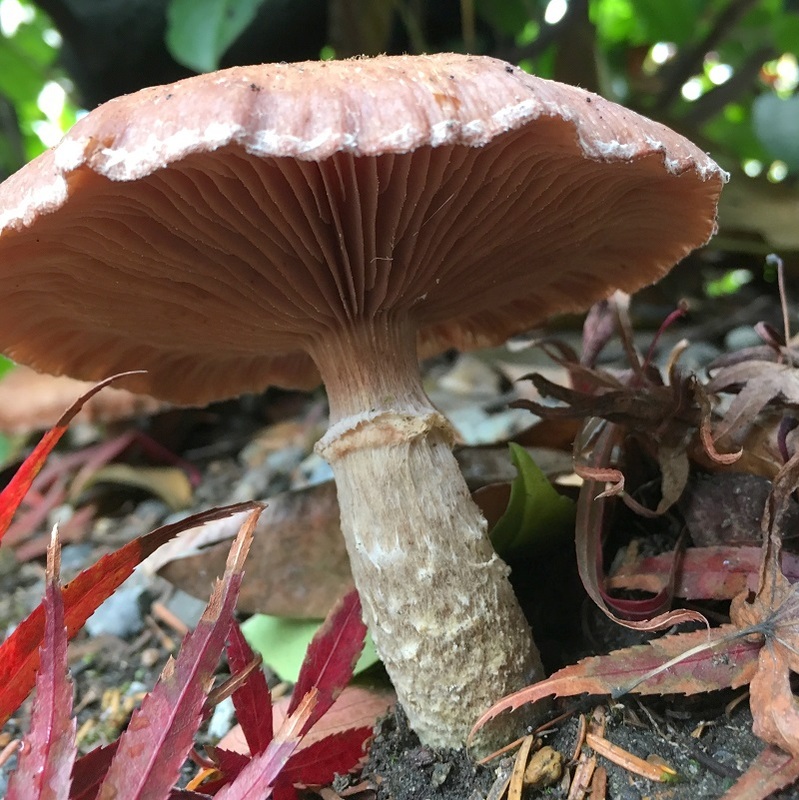 This is the time of year for some mushrooms to sprout in urban gardens here in the Pacific Northwest, and I discovered a new type under my laurel fence this year. Maybe they’ve been coming out every year, and I just haven’t noticed before! 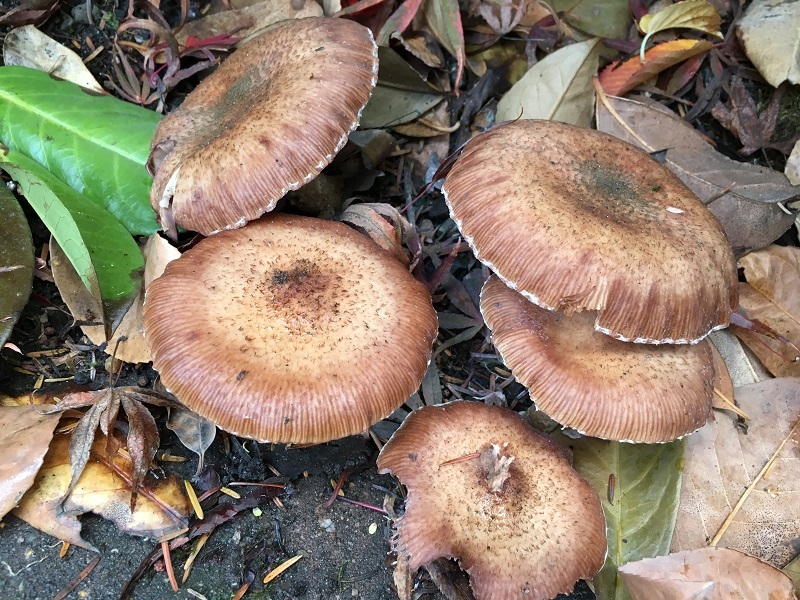 These are honey mushrooms (Armillaria mellea) .. there are several distinct Armillaria species within the group formerly called honey mushrooms (or honey fungus). The ‘honey’ is a reference to the smooth appearance of the caps, and not their flavor, which is anything but sweet. (I am not about to try these suckers by cooking them, thank you very much. I’ll stick to buying my mushrooms in the grocery store!). A view from the side that shows the little collar on the stem, and the adnate gills (gills fully attached to the stem). The cap is about 3 in. in diameter.